Celtic Marches is a single-estate apple cider producer, nestled in a quiet corner of Herefordshire. The self-sustaining cider producer is in a rare position, the result of over 100-years and numerous generations that have dedicated themselves to the orchards and hop fields. This has allowed for full control over its cider production from tree to glass. Awarded PGI status, you can be assured that only Herefordshire apples are used in its craft cider. 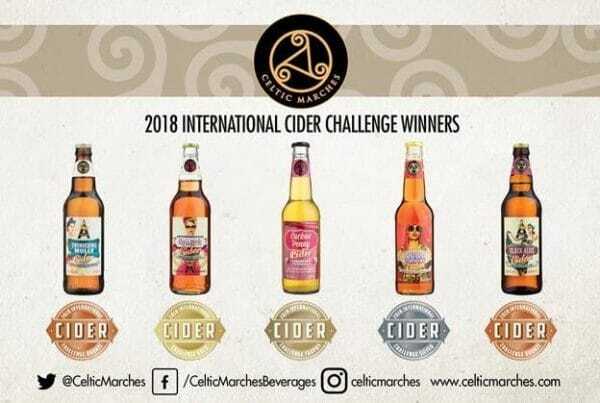 The blends have certainly been hitting the right notes as five of Celtic Marches’ ciders walked away with a prize at the 2018 International Cider Challenge. The Challenge celebrates the best ciders from around the globe. Blind taste tests by independent judge focus on taste, appearance and aroma. Thundering Molly and Slack Alice both received bronze awards, whilst Ruby Tuesday, a delicious raspberry cider achieved silver. Lily the Pink went for gold and Cuckoo Penny, a hazy rhubarb cider, stole the show and claimed the trophy.